It was about four years ago as a fan when I learned the difference between public and private autograph signings. Private autograph signings are not open to the public. Public autograph signings are open to the public. I enjoy the public signings because it’s the memory of meeting a particular player, brief interaction and hopefully a photo that is a perfect complement to my fandom. 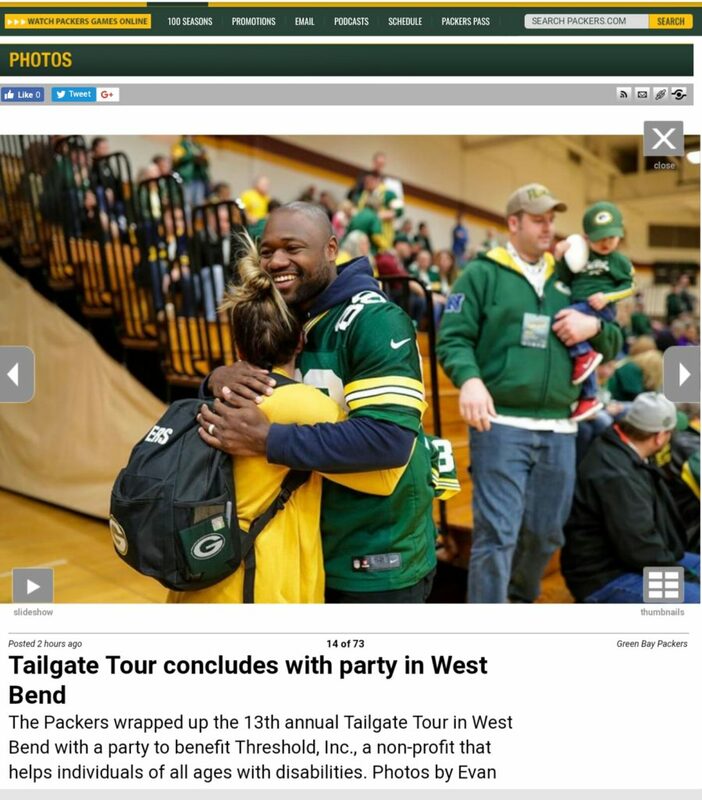 Last year was my first year purchasing a ticket to the Green Bay Packers Tailgate Tour which made both scheduled and surprise stops throughout Wisconsin & Iowa for five days in April. Tour celebrities included Kenny Clark, Blake Martinez, Ty Montgomery and Packers alumni Rob Davis, Antonio Freeman and Bubba Franks. Each stop was hosted by a local non-profit with one hundred percent of all proceeds benefiting the hosting organization. For forty dollars I got an autograph from all celebrities and scored a hug from Ty. 2019 would be the 14th year for the Tailgate Tour, and while I haven’t seen the dates yet announced for this year, last year they were published in February. 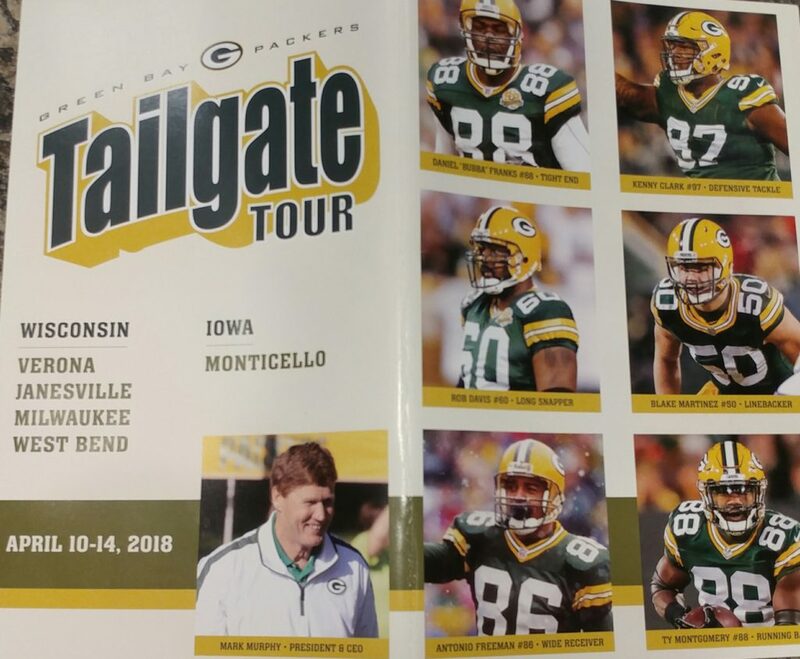 If you live in Wisconsin get the Tailgate Tour on your radar; it’s a great event. An address that should be on every fan’s radar is the fan mail address which is c/o Green Bay Packers at P.O. Box 10628, Green Bay, WI 54307-0628. Submit a request with a photo of your favorite player addressed to your favorite player and possibly get a reply back. Remember to make it easy and send a postage paid envelope for the return, no guarantees. From that point on I was conscience when asking that photos be signed to ask for an inscription which would hopefully be an assurance to the athlete that I wasn’t going to sell the item. For those attending training camp, I recommend the retractable black sharpie as the marker of choice. It doesn’t dry out when you’re standing, waiting, and the players don’t need to take the cap off. This week I am most looking forward to attending Mason Crosby’s public autograph signing this Friday at Waukesha Sportscards. 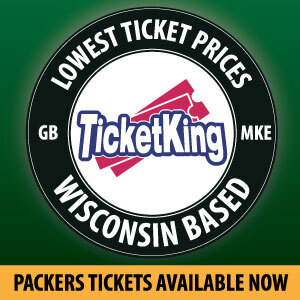 When I last checked tickets were still available at www.waukeshasportsccards.com and shipping was available to folks not attending in person. I’m physically attending and hoping that Mr. Crosby is up for a photo for Instagram! 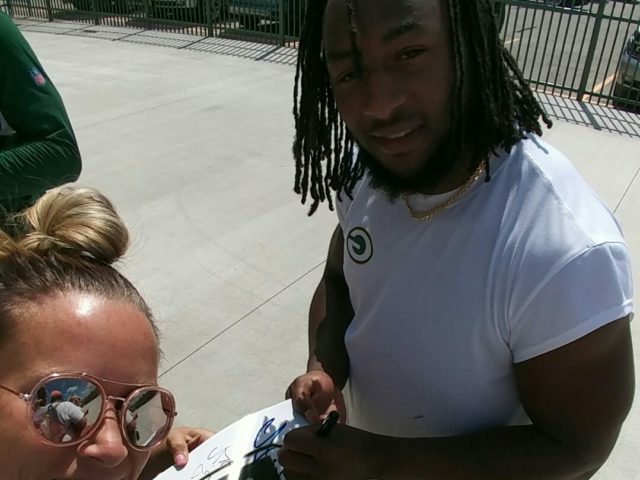 Waukesha Sportscards is also welcoming Aaron Jones on March 17th for a private signing. For those of you outside of Wisconsin, I found a website, www.cravetheauto.com which allows users to search by State of upcoming autograph signings. I did test Wisconsin, and the site picked up the Crosby signing but didn’t pick up the Aaron Jones signing. So again, no guarantees on this website that I found but remember Waukesha Sportscards will ship items. A 13x World Champion vibe always, Aaron Rodger’s tweeted that he was “Honored to make a difference” with Wounded Warrior Project, Sharpie, and the Player’s Tribune. In his article titled Something Bigger published by The Players’ Tribune in partnership with Sharpie on January 15, 2019, Aaron explains what led him to partner with the Wounded Warrior Project. 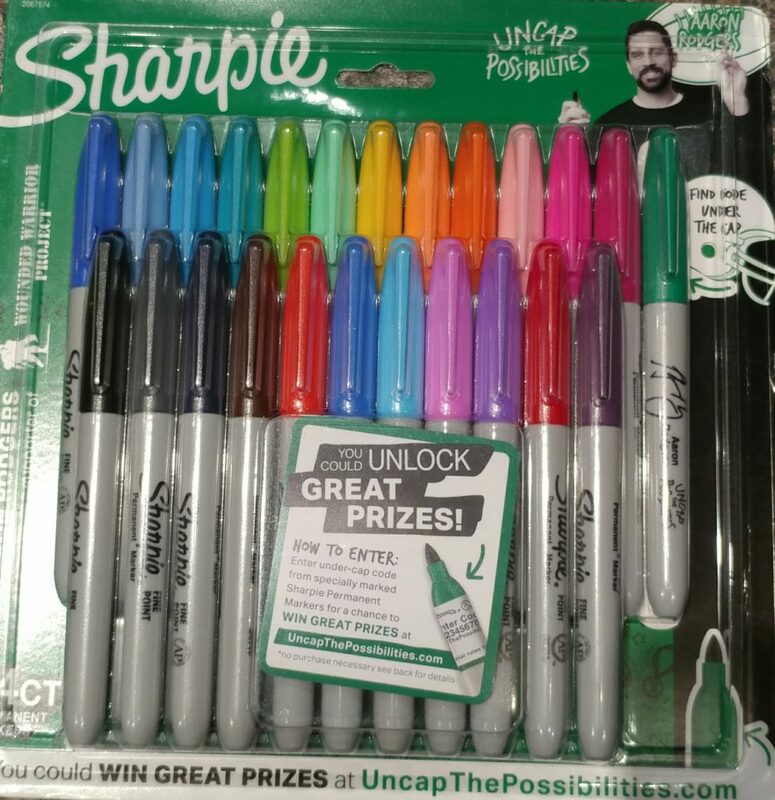 Buy an Aaron Rodgers autographed marker by ordering a Sharpie Fine Permanent Marker pack via Amazon for $17.95 and never take it out of the packaging. 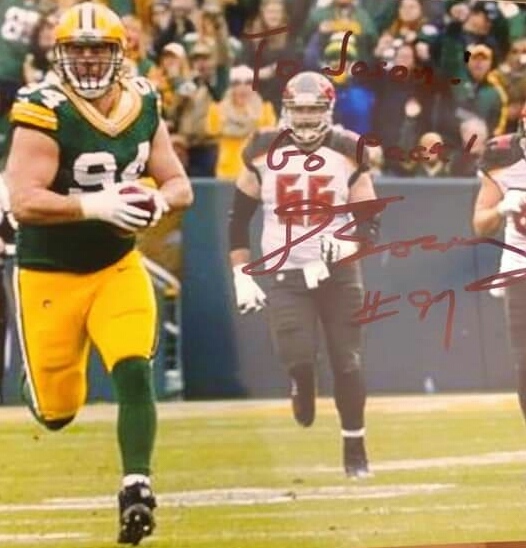 This entry was posted in Uncategorized and tagged Aaron Jones, Aaron Rodgers, Antonio Freeman, Blake Martinez, Bubba Franks, Green Bay Packers, Green Bay Packers Tailgate Tour, Iowa, Kenny Clark, Mason Crosby, Rob Davis, Sharpie, The Players' Tribune, Ty Montgomery, Waukesha Sportscards, Wisconsin, Wounder Warrior Project. Bookmark the permalink.